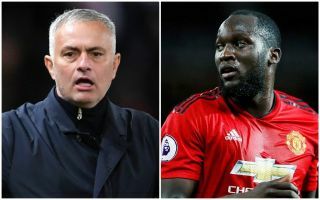 Manchester United manager Jose Mourinho has revealed the thinking behind his decision to drop Romelu Lukaku against Everton today. The Belgium international is on an awful run of form at the moment, failing to score in his last eight consecutive games for his club. Mourinho has gone with something different today, appearing to field Anthony Martial at centre-forward, with Marcus Rashford and Juan Mata alongside him in a three-man attack. Many MUFC fans will think this is the right choice after Lukaku’s poor form of late, with Mourinho admitting he had two reasons for choosing to axe him this afternoon that it’s pretty hard to argue with. Quoted by Charlotte Duncker of the Manchester Evening News, the Portuguese explained that Lukaku is in need of both a rest and of some time out of the limelight as his poor form is starting to affect his confidence. "The reason is he is playing lots of matches and lately, not just not scoring goals, but also not showing lots of confidence and sometimes we decide that the best thing for the players to be protected and away from the initial pressure." United have just one win in their last seven games and will hope this change up front today can inspire them to victory.